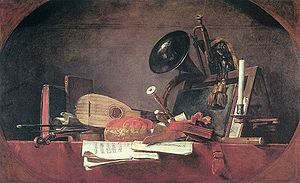 Jean-Baptiste-Simeon Chardin (1699-1779), The Attributes of Music (1765). A music teacher using a violin bow as a percussion instrument. Photo: Ostra Studio (c. 1930s). Music is an art form that involves audible sounds and pitches (and silence) organized in time to create a chosen artistic or aestetic statement. It is expressed in terms of pitch (which includes melody and harmony), rhythm (which includes tempo and meter), and the quality of sound (which includes timbre, articulation, dynamics, and texture). Music also involves complex generative forms in time through the construction of patterns and combinations of natural stimuli, principally sound. Music may be used for artistic or aesthetic, communicative, entertainment, or ceremonial purposes. The definition of what constitutes music varies according to culture and social context. In a computer and modern Hi-Fi devices, music is stored in files using various audio file formats such as MP3, Vorbis, WAV, AIFF, AU, Windows Media Audio (WMA), and AAC. This page uses content from Wikipedia. The original article was at Music. The list of authors can be seen in the page history. As with Spanking Art, the text of Wikipedia is available under a copyleft license, the Creative Commons Attribution Sharealike license. This page was last edited on 9 March 2010, at 15:30.